If you cut a slot in the top of your router table, you can use a miter gauge when you're routing. 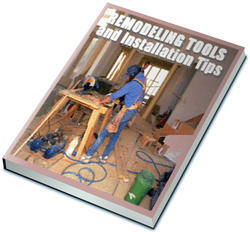 To do this, use double-sided carpet tape to position a 1 "-thick guide strip 4" from the front edge of the table top. 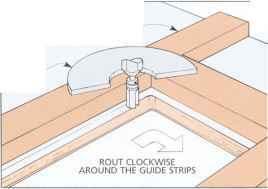 This guide strip will form the inside edge of the miter gauge slot (Fig. 1a). Now, to position the other guide strip, hold the miter gauge snugly between the two strips and stick down the second strip (Fig. 1). To set the depth of a pattern bit, place the miter gauge bar on top of a guide strip, and the router on top of the bar. Then lower the bit to barely touch the table top Now remove the miter gauge and rout the slot (Fig. 2). 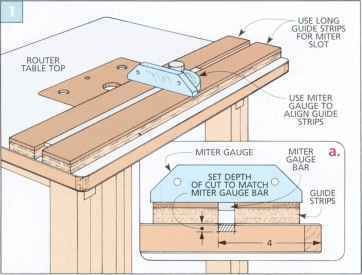 Note: You can use this same method for routing miter gauge slots in other wood table tops and jigs. 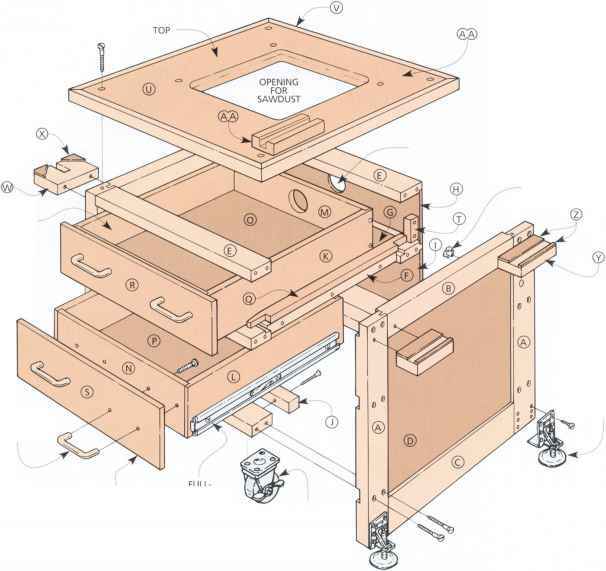 Whether or not you build any other part of this router table, the hardwood fence is definitely worthy of consideration. It has three useful features: a T-slot for accessories, a pair of sliding faces, and a special clamping system. sliding faces. The faces on the front of the fence are made to slide open. 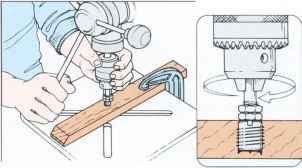 This flexibility allows you to adjust the opening so it fits whatever router bit you're using. clamping system. The fence is also designed so it can be adapted to fit any router table (even one you may already own). The built-in clamp heads on each end that secure the fence to the table can easily be adjusted to match almost any table top. The fence is made up of four sections: a split base, a top bar (with the T-slot), sliding faces, and the clamp heads. top & bottom. The base is eventually cut in half to fit around the router bit. But it starts out as a long strip that consists of two pieces. One is a l'/n;"-thick top piece (I) with four dadoes cut in it. And the other is a :i/i"-thick bottom piece G) (Fig. IS). The idea is to sandwich these two pieces together to form one base with four slots. Knobs will eventually be able to pass through these slots to hold the sliding faces in place (refer to the Exploded View on page 61). To determine the length of these base pieces, first measure the total length of the router table top (30" for the table shown here), and then add 6". This will allow 3" on each end for the clamp heads. After the two base pieces are cut to length, cut the four dadoes (slots) in the top piece (I). Space one 3/8M-deep dado 33/4m from each end (Fig. IS). Then move in another 33/4M and cut another set of identical dadoes. assembly. Now you can glue these two base pieces together. decided to use a simple technique to keep the two base pieces aligned. Before applying any glue, align the edges of the two pieces so they're flush, and dry-clamp them together. 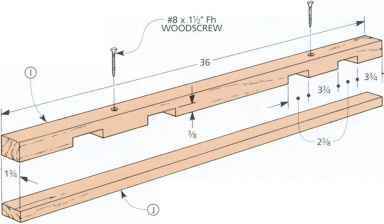 Then screw the pieces together with a couple of countersunk woodscrews (Fig. IS). Now remove the clamps, apply glue, and screw the pieces back together. The screws will automatically realign the pieces and keep them from sliding as the clamps are tightened. 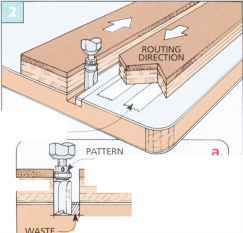 loiter, the base will be cut into two sections to create an opening for the router bit (see inset photo at left). But for now, leave it as one piece, and begin working on the sliding faces (K). Each sliding face is half the length of the base (18"). And the width (height) of each face is Vk;" less than the height of the base (Fig. 14). This creates clearance so the sliding faces won't bind against the top bar (added later). To allow the sliding faces to get as close as possible to the router bit, I beveled one end of each piece (Fig. 14). 1 also routed a small chamfer along the bottom edge of each face. This chamfer serves as a relief for sawdust. threaded inserts. After the chamfers are routed, the sliding faces are almost complete — all that's left to do now is install the threaded inserts. The problem here is making sure the threaded inserts are aligned properly with the slots in the base. To do this, hold the sliding faces in the closed position and flush with the bottom of the base. Then use an awl to scribe the positions of the slots on the backs of the faces (Fig. 15). With the slots located, you can drill holes for the threaded inserts. Center these holes on the scribed lines and near the end of each slot closest to the bevel (Fig. Id). Note: The hole needed to fit most 5/i6M-inside diameter threaded inserts is Vs" deep. Just drill to fit the insert; don't drill too deep (Fig. 16ci). Finally, install the threaded inserts in the faces (see Shop Tip below). Whenever possible, I like to use my drill press to install threaded inserts to make sure they are straight and square in the workpiece. To use the drill press for installation, start by sawing off the head of a bolt that fits the insert. Next, thread two nuts and the insert onto the bolt and tighten the nuts against the insert. The next step is to mount the bolt in the chuck. Finally, with the drill press turned off, you can install the insert. Using the control arm for pressure, screw the insert into the hole, turning the chuck clockwise by hand until the insert is flush with or slightly below the surface of the workpiece.